On Wednesday I expected a bounce to 1016ish to complete wave [ii]. The market finished the week at this very level, just to leave the door open for both counts. So far, there is no reason to change my primary count with the little exception that the rally from 992 looks quite bullish. 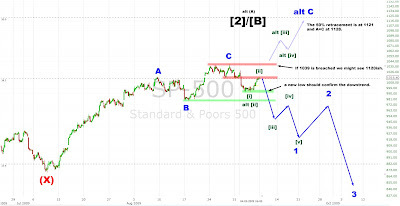 Regardless of which count will be the right one, we should see a big move in the coming week, either a wave [iii] down or a [iii] up. Anything below 992 should confirm a wave [iii] down, whereas a break of 1039 would be the trigger for [iii] up. The big picture: No need to change it. Still expecting the top between 1014 and 1120. EUR/USD: It tested the lower trendline of the rising wedge, but didn't really sell off afterwards. 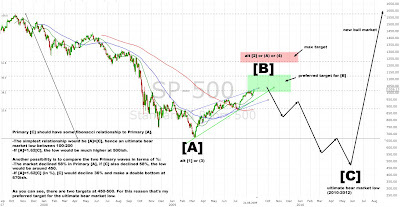 So far, it's still possible that a new downtrend started a few weeks ago. A break below 1.4050ish would confirm this. Anything above 1.4446 would invalidate it.